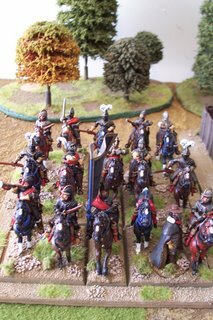 A unit of 15 mercenary Cuirassiers that I use with my Swedish army, of course I feel that they would be more at home in a Austrian or Brandenburg force. I am not that sure if Sweden employed units that were so heavily armoured during 1655-60 but as a huge fan of the books of Henryk Sienkiewicz and especialy 'The Deluge', I feel they belong in my Swedish army (have yet to play a game with this army). There are 9 Redoubt Miniatures and 6 Essex Miniatures figures in this unit and they mix really well (mounted on Elite Miniature horses of course). I really like Redoubt Miniatures because of the many varients (seperate legs and body) and heads. Redoubt heads are great but about 25% of them I do not like and seem too small but the excellent husband and wife team from Eastbourne always send twice as many heads that I need (I do recommend looking at their extensive site). The dismounted figure is an armoured bishop from the Redoubt 3 Musketeers range and can be replaced with others depending on the figures bought in your army (photos later).